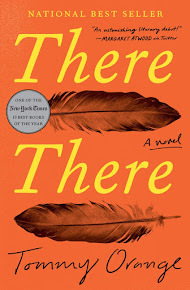 Summary (from the back of the book): In her fiction debut, which has been hailed as a powerful novel told through stories, Doreen Baingana follows a Ugandan girl as she navigates the uncertain terrain of adolescence. 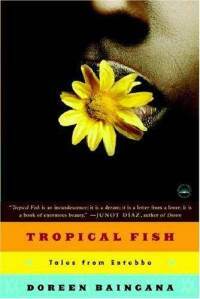 Set mostly in pastoral Entebbe with stops in the cities of Kampala and Los Angeles, Tropical Fish depicts the reality of life for Christine Mugisha and her family after Ida Amin's dictatorship. Review: I am on the Board of Turn the Page Uganda so thought this would be an interesting book to read, that I would gain some more knowledge about life in Uganda. I was a little weary of the fact that is short stories since that isn't really my favorite format to read. However, the short stories were all a about the same characters and happened in chronological order so it really read a bit more like a novel, which was good for me. I don't feel like I learned that much about Ugandan culture from reading this book, but that's okay, as it was more character driven than I had expected. At the start of the book Christine is fourteen, looks up to her two older sisters, and wants to do well in school and date boys. What's nice about this is that her family is middle class and the reader realizes that middle class families all over the world are very similar. So much of what we read set in African nations centers on poverty and rural life that this book is a nice change. Three of the chapters are narrated by Christine's older sisters who are trying to navigate their way through boarding school and life as they emerge as adults. I don't really want to say much more since if I do I'll give away the plots to their stories, suffice it to say, life isn't always easy when one is a free spirit. I preferred Christine's stories (the other eight) to those of her sisters. She grows up, does well in school, moves to the United States for eight years and, in the final story, comes back home to Entebbe to work. I liked that flow of the stories, that we got to see Christine go from fourteen to a woman in her late twenties. However, I didn't' love this book and I am not sure why. It just didn't grab me the way I had hope it would. Click to see my updated Google Map. I really want to visit Uganda, not only because of my work with Turn the Page Uganda, but because I feel like I have read quite a bit about it and would like to see it in person. I have a friend who has gone three times in the last year or so installing volleyball courts in schools and teaching the students how to play. He says he has a wonderful time.